Well, this was a little hurried and late, but I introduced some largish changes into what’s going to become RC2 just a few minutes back. No new strings, to the best of my knowledge. Let me explain what they are. Harry de Valence worked with KStars this summer and his (GSoC) project involved writing code that would render the sky map with OpenGL, while still keeping the native QPainter drawing, to ensure that KStars doesn’t crawl on older hardware without hardware acceleration. Well, Harry’s task was rather tough, because he had to deal with badly structured code, but he was able to give us a working OpenGL sky map with a few regressions at the end of his project. The most important unsolved problem, however, was that there was no way to switch between the two paint engines at run time. We decided not to leave the code in Harry’s branch, and merged it into trunk, so that the code would be more accessible, and we might arrive at a solution at least before release. When 4.6 was branched out from trunk, we had a version of KStars that would throw up a black screen with some text at the corners upon launching! This was one of the regressions with OpenGL — you couldn’t use infoboxes (those boxes that tell you what KStars is looking at, what the time of the simulation is etc.) with GL, so you had to manually disable them to see the sky map. And to add to that, we had a couple of other problems with GL. And you couldn’t switch out of GL without rebuilding KStars. Of course, one of the solutions was to just disable GL and fallback to QPainter, without adding any new functionality, but lots of new code. I didn’t want to subscribe to this — it gives me this feeling that I’m doing what some proprietary software companies do to enforce DRM. Our solution to this problem involved breaking up a class that’s very central to KStars — the SkyMap class, which took care of the sky map in totality — painting, projection, events. Not good. Harry had already broken away projection, and in the process of cleaning the code, solved several really strange bugs in KStars. What was left was to break up painting and event handling, so that we could change our canvas at run time. This time of the year being the winter break at UT Austin, I thought I should finish this. My implementation of this (warning: physics student trying to write code) is now merged into the 4.6 branch. I should’ve probably done it before, but yeah, it stretched to fit the time before RC2. The only regression I observe with this change over the usual native painting functionality, is that infoboxes flicker when you drag them around. I’m sure that’s a very small thing to trade for the awesome speed and smoothness that GL gives you, when you need it. Switching to OpenGL backends at runtime! We most certainly need a whole lot of testing. Please help the KStars team by seeing if it builds, renders fine, switches backends with no issues, and file any bugs you may have on bugs.kde.org. We will try to fix them before the final tag. Time for me to get back to physics now! I just built kstars from trunk and gave it a try with fglrx driver. I am sorry to say that it does not work at all 😦 I only see a white screen and when I start to move the scene I get lot’s of flickering with visible stars in between. Btw: which OpenGL version are you targeting? Just tried on my other system with nouveau driver (which renders KWin GLES correctly) and I see some rendering artefacts in the milky way. If i remember it was reported that it worked fined with mesa’s software rendering. I have no way of testing that easily before the final version is out. Wouldn’t it indicate that the problem is in nouveau? As for the fglrx driver, do you have any clue where the problem might be? If i remember it was reported that it worked fined with mesa’s software rendering. Wouldn’t it indicate that the problem is in nouveau? Maybe? Maybe not? Difficult to say. As I have problems with other drivers as well I would not bet on driver bugs. As for the fglrx driver, do you have any clue where the problem might be? No sorry, I do not know the KStars code at all. So I cannot comment on it. I want to ask if the QPainter backend works properly on these systems. If that is not the case, this would be release critical, and we may need to revert the entire OGL stuff. Can you see the Sky map in QPainter mode with no regressions? With intel graphics, it works very well. I couldn’t see any rendering glitsches. Works quite fast. Though I had to deactivate the rendering of the milky way while moving as this was very slow. Oh. I haven’t had Milky Way trouble. But when running at 2 minutes / frame speed, I got 16 fps with OpenGL and ~ 6 fps with native painting. how do you get the fps numbers? If you built with debugging, then you’ll see the FPS numbers being written to the console. Maybe we should do something more elegant. Last year, I was at FOSS.IN and this played a major factor in increasing my enthusiasm for FOSS contribution. I saw and met a whole bunch of FOSS Developers, primarily KDE and Debian contributors, particularly Till Adam (KDE), Kartik Mistry (KDE.IN, Debian) and Christian Perrier (Debian) and that really drove me to contribute. The same night, I went back and built KDE 4.x on my desktop, which I had ‘given up’ after some stage earlier. Thereafter, I produced patches more frequently than earlier. This year, I really wanted to go to FOSS.IN – It’d have been a ‘debut’ as a “developer” – but the schedule of end-semester examinations at my college matches perfectly with that of FOSS.IN, preventing every FOSS enthusiast / developer here from attending the event. That the KDE.IN team has done a lot more this year than the last is very obvious. This time we had a significant number of people helping with the planning. I have been out of the loop this semester, unfortunately, due to academic work (or so I claim. Anyway, it was a general observation amongst my friends that I was more ‘serious’ when it comes to academics this semester), and didn’t help much with the planning. But the signs are very clear that it is going to be bigger and better than last time. Recently, there were these ‘Pillars of KDE’ posters that the KDE.IN team made for FOSS.IN and they’re put up here in Pradeepto’s blog. Like the transition from KDE 3.x to KDE 4.x, at first sight, the posters seem to have gathered a significant amount of ‘visual appeal’ from FOSS.IN/2007 to FOSS.IN/2008. Kudos to Kamaleshwar Morjal for such brilliant posters! Waiting for FOSS.IN to start. There’ll be a lot of live blogging, as usual, I presume. This is (hopefully) my first post on Planet KDE! I didn’t know that we could have ourselves aggregated on Planet KDE with an svn commit until I “accidentally” stumbled upon the “Add your blog” link while adding Planet KDE to the RSSNOW plasmoid. I wish to introduce myself to Planet KDE through this post. Yes, I hadn’t been in touch with the KDE world for long and only lurked in #kdeedu or posted on kstars-devel@kde.org, until I made it to the last 2 days of aKademy 2008 (thank you Bart, Kenny, Wendy, Pradeepto! ), which I thoroughly enjoyed! So who am I? Not getting philosophical, I’m called Akarsh Simha in the real world, kstar on IRC, and asimha on the SVN, and am a student pursuing the BTech programme in Engineering Physics at the Indian Institute of Technology Madras (“IITM”), India. I have currently finished two out of four years of my course and am running on the third. I plan to pursue a career in Theoretical Physics. Programming / Software Development is one of my “primary” hobbies, the other being Amateur Astronomy. I develop for KStars and was a Google Summer of Code (2008) student under KDE, mentored by Jason Harris. I’m a not-so-active member of the KDE India community. I was browsing through Flickr photostreams tagged by aKademy2008. Finally, I found, what is currently (till Anurag uploads all the photos he shot) the sole photo of mine from aKademy. Here’s a photo by Mr. Park (Korean KDE Developer, from his photostream) at Brussels Centraal Station, where we parted. Left to Right are Me, Pradeepto, Anurag and Mr. Park. And this is possibly the only “proper” photo I have on the internet. :D. Thanks Park! An idea for easy KDE development within IIT Madras. I think the most painful part of developing KDE is to build the dependencies etc from the SVN checkouts, i.e. setting up the development environment. Now, let’s say I’m developing kdenetwork. I will need to have qt-devel, checkout and build kdesupport, kdelibs, kdepimlibs, kderuntime and then kdenetwork. Now, a newbie who does know C++ need not be very comfortable with the build process or with debugging the builds, but could be capable of coding for KDE. Why not set up a KDE development server within IIT Madras, to which you can SSH with X forwarding and just start developing? For starters, let’s say I do this on my machine. What I would do is to create a new user account for “public” KDE development, and then learn to use kdesvn-build to automatically maintain fresh copies of KDE. Then I could request anyone who is interested to create an SSH key and mail me their public keys, so that I could put it in the authorized_keys of this account. This way, there will be no password sharing hassles. Whenever someone wants to kontribute, all he need to do is to login through SSH, make his changes and build. Of course, once a developer has created a patch of his work, he could do an svn revert, so that it keeps the work clean. The major trouble of making a public server of this type would be the bandwidth limitations that would cause SSH with X forwarding to be unmanageably slow. Any suggestions / ideas? Over a long term its better for people to learn to build stuff. Its one of those skills which can only be learnt by breaking your head. Well, since I’m planning to do it at a local-intranet-level, it shouldn’t be much of a problem. If someone wants to develop something for which the dependencies aren’t met, he could contact the server maintainer and let him know. Yes, over a long term it’s better that developers learn to build, but that should not be a hindrance for contribution. FWIW I am with Akarsh on this one, learning to build is a barrier to entry in many cases and a needless one! Well, I thought this will be a very useful thing in crossing the “activation energy” barrier, but it seems to be absolutely useless. 2.5 million stars in trunk! Yay! All the machinery for loading 1e6 stars has been moved to trunk and the 2.5-million-star Tycho-2 catalog has moved to the ‘Download Data’ (Get Hot New Stuff) feature. I plan to put up a screencast on how to use this and the conjunction tool from KStars sometime, along with a whole lot of other features. To get the Tycho-2 deep catalog, just click on File->Download Data and click ‘Install’ next to ‘Tycho-2 Star Catalog’. @Carlos: Sorry for such a late response. It is probably because you aren’t using the latest version. 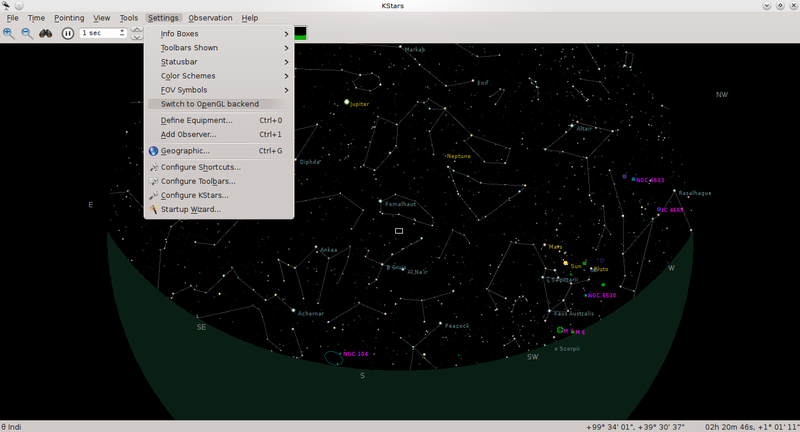 The Tycho-2 catalog works only with KDE 4.1.60 or something like that (and above). Currently, the 2.5 million stars are in what we call the ‘trunk’ (the source code that developers work on). You will either need to wait till Ubuntu ships the new version of KStars or compile it from the sources. KDE.IN Monsoon Hackathon – Day 3??? Day 3 was a flop show for me :P.
I got up at 1:00 PM, when the Hackathon was _over_. But, well, that was a slightly well-deserved sleep. I joined the folks from the Hackathon over lunch, just like that. Shashank taught me how to enable his Panaromio plugin, and I think I must investigate it sometime. Great, so I’ve done nothing today, other than fart on the way to the BIAL (seeing of Pradeepto and Sharan Rao). And I hope to start right away. Pradeepto, for organizing the whole thing. I’d like to have more hackathons. There’re four of us in Bangalore till 17th… so maybe? Day 2 turned out to be very productive for me. As you have figured out, my hacking ends only by 3:00 AM, back at home. It’s just that the “spirit” of the Hackathon gets carried home with you, because when you leave a problem half-solved, you have the itch of solving it completely. I am completely satisfied with today. I’ve made about 8 commits today. Double click on a conjunction and you see the conjunction happening! Start work on the Auxinfo hash?? Sharan Rao taught us the use of EMacs / KDE EMacs / EMacs + GDB scripts. [Screencasted]. GDB integration rocks bigtime! Tejas quickly learnt to use GDB+Vim! We had a really nice chat about KDE development, KDE developers, aKademy, Contribution to KDE from India etc. over coffee. Dinner time was more of general talk. I’m sorry for such a disorganized blogpost, but that’s all I can write at 3:00 AM in such a sleepy state. Goodnight! 4. Total Solar Eclipse near Bangalore in 2010 January???? 5. Photos will get here shortly.